The paradox is this. 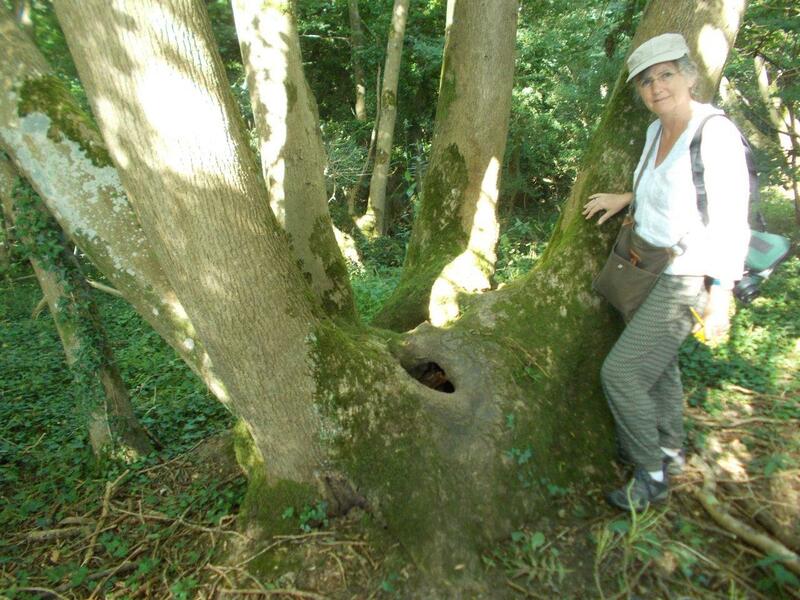 How could an Ancient Woodland of 'national importance' be the government's reason for rejection of an Arundel bypass route in 1992, and yet, in 2018, be destined by Highways England for destruction by the new Arundel Bypass Option 5A? 1992: Hundred House Copse, one of the 20 named woods that make up Binsted Woods, is of such high ecological value that potential damage to it caused an Arundel bypass route to be rejected even before suggested routes were compared in 1992-3. The route (Green 1) did not even go through Hundred House Copse, but was ruled out because its suggested at-grade roundabout was likely to be replaced by a flyover at some time in the future, damaging the ‘valuable woodland block’ that includes Hundred House Copse. Another suggested route (Green 4) was rejected because it encroached into Hundred House Copse. 2018: Hundred House Copse is now destined to be largely destroyed by the new 12-lane junction for the Arundel Bypass Preferred Route, Option 5A. A grove of ancient ash coppice trees, c.800 years old, probably planted as fuel for the mediaeval pottery and tile kiln just south of Hundred House Copse excavated in the 1960s. War Dyke defined an area using the loops of the river Arun, the Tortington Rife, and a bank and ditch from southern Binsted up to the top of the Downs and down to the river Arun. There are two late Iron Age enclosures in Goblestubbs Copse, on rising ground within this defined area, recently excavated by Worthing Archaeological Society. It’s now thought that these defined areas (known as ‘territorial oppida’) were used for trading with the Romans before the Roman invasion. 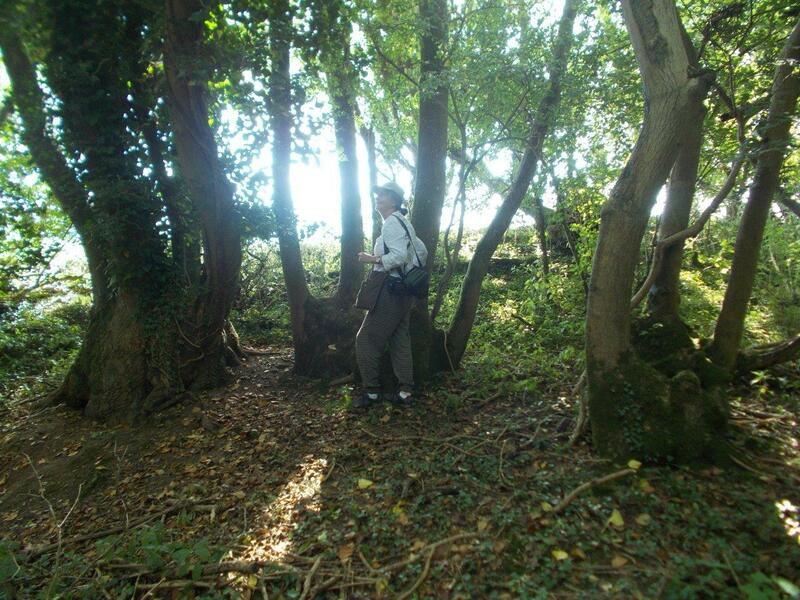 The earthwork section in Hundred House Copse is one of only two ‘double’ sections, i.e. consisting of two parallel banks and ditches. The other is on top of the Downs, part of the scheduled monument. Option 5A would destroy the double section in Hundred House Copse and its meaning and function may therefore be lost to scholarship. The chalk stream is likely to be massively affected by Option 5A, partly by destruction and partly by increased pollution and run-off. The Moot Mound and ash grove are outside the footprint of the road but may well not survive construction works, and their landscape context would be severely damaged. Scotland Lane, the mediaeval track which can now be interpreted as leading to the Moot Mound, would be severed. 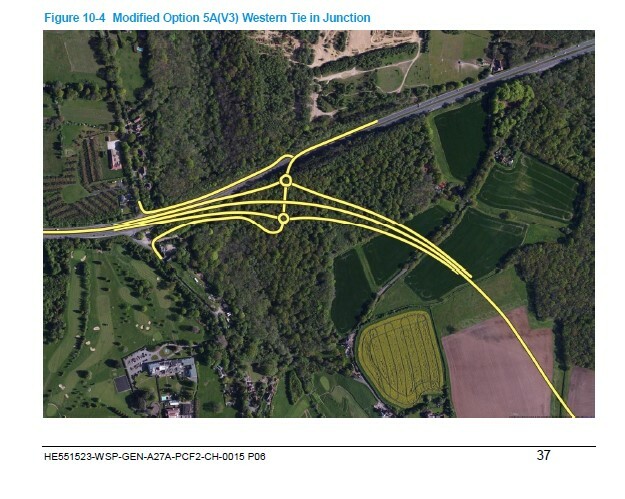 Highways England included a new graphic of Option 5A’s western junction in their ‘Scheme Assessment Report’ published in May 2018 (Fig. 1 below). At a public exhibitions about the announcement of 5A as the Preferred Route, they stated that the junction was being redesigned to affect less Ancient Woodland. In their video animation about the route, the junction area was simply a circle with ‘being redesigned’ in it or similar. But in this report, it appears that the junction now takes more Ancient Woodland than the design in Highways England’s 2017 public consultation. That had a highly unconvincing 8-lane junction with direct access across the A27 from the B2132 and Shellbridge road (the two north-south roads N and S of the junction). In the new version, the two north-south roads are connected to the junction by two additional slip roads parallel to the two slip already in the draft design, making 5 parallel roads. If the four slip roads are two lanes each, and the new A27 four lanes, this is twelve lanes of traffic imposed on this unique area. The previous high estimates of Hundred House Copse’s value – and the 1992 study of Binsted Woods that showed them to be ‘of national importance’ – were not made available to respondents in Highways England’s 2017 public consultation. 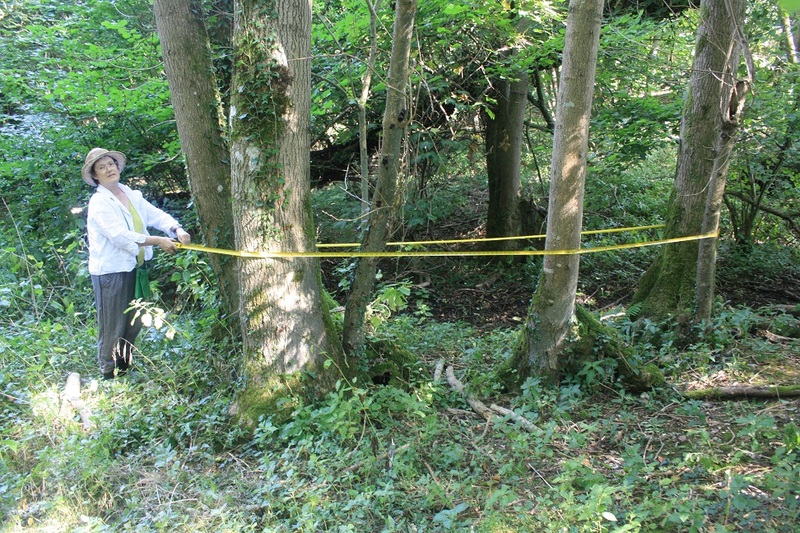 As well as failing to explain the damage 5A would cause to Hundred House Copse, the 2017 consultation contained hundreds of other errors and omissions, which hid the damage to Binsted Woods as a whole, Binsted Village and historic parkland in Binsted Woods. The supposed economic benefits of the route, and its contribution to reducing traffic in Storrington, were incorrectly inflated, and its economic benefits were massively overstated, as is now shown by the revised figures in Highways England’s own 2018 report. A legal case against the Preferred Route decision, based on these defects, is pending. It is time this erroneously promoted and extremely damaging scheme was cancelled.